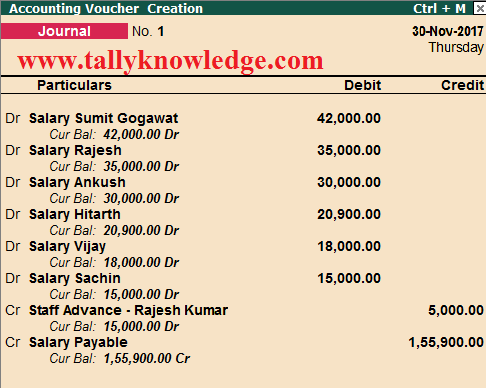 Home / TallyERP.9 Lessons / How to Pass Salary Payable voucher in Tally.ERP through Journal Vouchers? All ledgers of Salary under indirect expenses create in the same manner. Now we create Ledger "Salary Payable" under Current Liabilities, which will be use to made payment to each employee after deduction of advance, tds or any other liability. For Example: Rajesh get Advance of Rs. 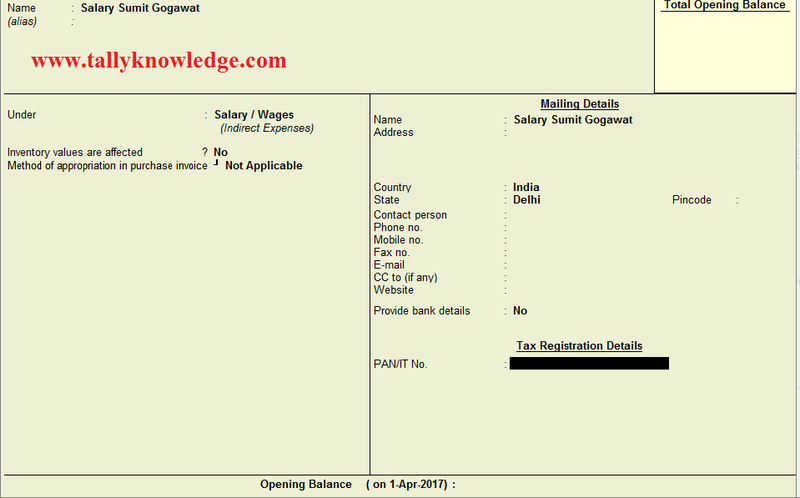 20000 from company on 1st December 2017 and we need to enter payment voucher of Rs. 20000 as staff advance in the name of Mr. Rajesh. Note: Staff Advance ledger will be create under Current Assets/ Loans and Advances. Mr. Rajesh is agree to deduct Rs. 5000 per month for next 4 months from his salary. Then his net salary will be 30000 but we debit his salary @ Rs. 35000 and net payable to him is Rs. 30000. Above entry is a simple example without any deduction or advance to employee or any statutory dues. Expenses of Salary debited to Profit & Loss account and amount payable to employees go to Current Liabilities as outstanding. Now we create Entry of Staff Advance. Below is the example of Staff advance entry. Above screenshot showing that advance to Mr. Rajesh Kumar deduct Rs. 5000 from his november month salary and net payable is reduced to Rs. 5000. 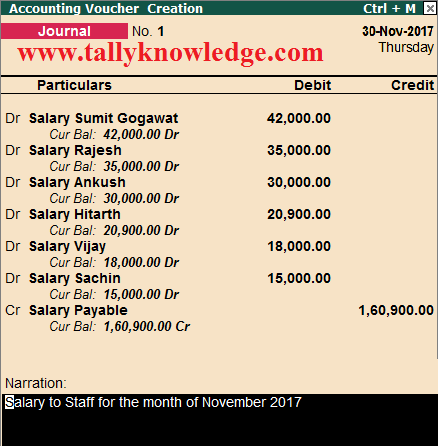 If you want to show Net Payable effect in each employee salary then you need to create each employee deduction ledger under current liabilities. Can you give me all concept of tally with examples in my Gmail id.